While staying at the lovely Porters Court 3, you will be able to wake up every morning and take a refreshing stroll on the beach. The home is situated just a short walk away from the nearest beach, which makes a morning jog worth getting up for. Porters Court sits in a delightful and exclusive development surrounded by vibrant gardens which are entirely closed off from the public. The villa's lovely blue exterior is enhanced by surrounding palm trees, plants and flowers and a charming stone pathway and steps lead up to the entrance. This is definitely a home that is just as attractive outside as it is inside. The beautiful communal pool area comes alive with colourful tropical flowers encircling it. Both bedrooms benefit from high ceilings and minimal colours with patterns tastefully added over the bedding. The rooms are beautifully brightened by natural light beaming in through the windows and are embellished with touches of colour. The open plan living area is gracefully styled with smooth laminate floors and touches of bright and baby blue. The room contains a flat screen television for evening entertainment – not that you'll use it much in this idyllic tropical climate! The delightful dining room is decorated with tropical colours with plenty of light exuding windows. The dining room has access to the patio which also holds a pleasant seating area for eating al fresco. 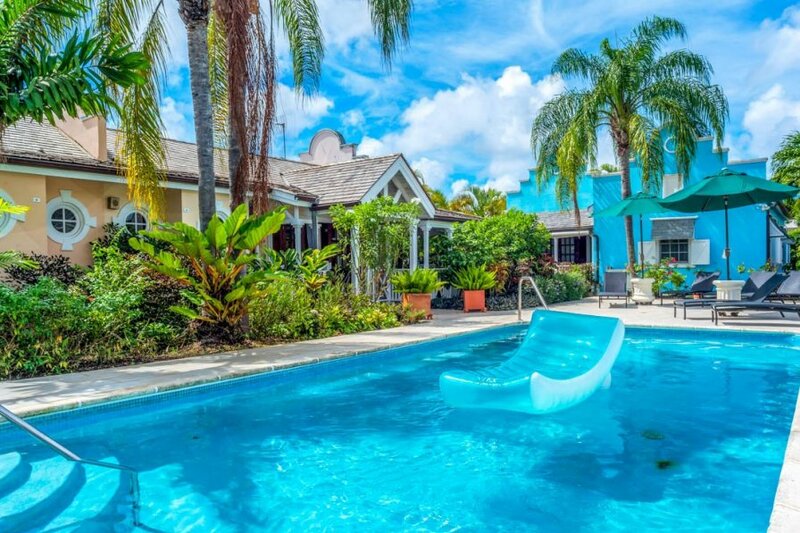 Porter's Court 3 is a charming 2-bedroom villa. The villa has a lovely outdoor eating area, the use of a communal swimming pool and is moments from the beach. Porters Court is located in the luxurious and upscale area of Porters. A place that is famed for its array of lavish villas, resorts and holiday homes, and, of course, its glistening stretch of sandy beaches. In the mood for a thrilling day out? Head down to Holetown for water sports and snorkelling tours. Start by swimming with turtles and puffa fish before swimming above a coral reef and over a shipwreck. A helpful guide will lead you across the crystal-clear waters, telling you all about life under the sea. With a GoPro in hand, you can solely focus on swimming while your guide captures a few snaps. The tour comes with the correct snorkel gear and equipment, so all you need is yourself to enjoy this mesmerising journey into the Caribbean Sea. Rum punch will also be served during the tour! Nestled off the beaten track, Petrea Garden is a glorious natural haven just a 5- minute drive away in Bridgetown. This is by far one of the island's most popular and beautiful garden attractions and is wonderful to simply just admire. Visitors to Petrea will have the opportunity to feed the range of fish who reside in the garden's pond. The gardens allow visitors to immerse themselves in nature and make the most of the surrounding tranquillity.